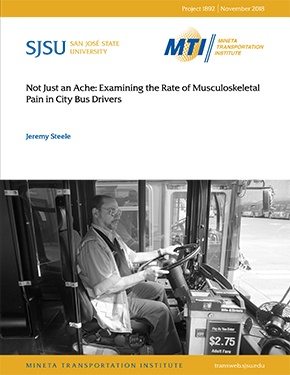 This paper examines the rates of musculoskeletal discomfort in a sample of 957 city bus drivers at King County Metro, a public transportation agency serving the greater Seattle area. It also examines how often such pain prevented drivers from doing their normal work, needed treatment from a medical professional, or incited one or more worker’s compensation claims. To assess the level of musculoskeletal discomfort in city bus drivers, an anonymous survey was distributed to drivers at King County Metro, a public transportation agency serving the greater Seattle area. This survey consisted of a Nordic Questionnaire asking drivers whether or not they experienced pain in certain areas of the body in the past twelve months, along with a small section asking for basic information such as age, hours per week worked, and gender. The results of the survey demonstrate that bus drivers experience very high rates of musculoskeletal pain, with 85% of respondents indicating pain in at least one area of the body. Comparisons to CDC data show higher rates of musculoskeletal pain in this sample than in the general population. Female and full-time drivers showed consistently higher rates of pain across all areas of the body then their male and part-time counterparts, while variables such as BMI and age showed less influence. Rates of pain in the lower back, shoulders, and knees were especially elevated. Of those experiencing pain in at least one area of the body, more than 50% were prevented from doing their normal work and visited a medical professional. For all drivers experiencing pain, there were large gaps in the rates of medical visits and worker’s compensation claims. Policy recommendations include the provision of active-suspension seats in the agency’s fleet of buses and better placement of key controls in the drivers’ workstation, two goals potentially attainable through increased participation of drivers in the bus-procurement process. The role of different route types, stop placement patterns, and road surfaces in addressing rates of musculoskeletal pain in bus drivers should also be investigated. Jeremy Steele is currently in his final year of pursuing an undergraduate degree in Geography (Urban Systems) and Software Engineering at McGill University in Montréal, Canada. He works as an independent contractor for MTI, after having completed a summer internship there in 2018. His research interests lie in urban transportation planning, specifically in areas including route design, accessibility, and ease of use for riders.